I went to the Mansion today for my weekly story reading to the residents. Sylvie was waiting for me. The minute I saw her face, I knew something was wrong. She looked stricken, even terrified, a look I had never seen on her face before. One of the Mansion aides had warned me she was very upset, something about her hats and tote bags. I must have given Sylvie 20 hats over the past year and the Army Of Good sent a whole bunch of tote bags, which she used for her research on religious matters. 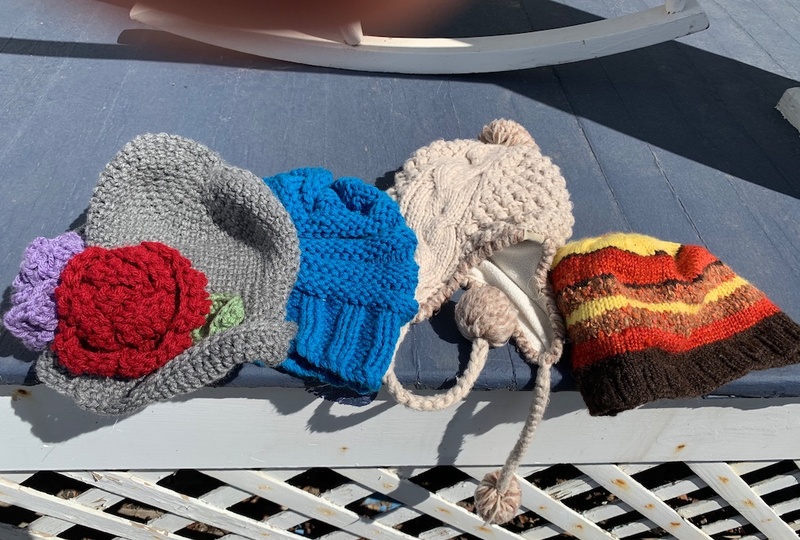 The hats are so important to Sylvie, she says they keep her head warm but I think they mean so much to her, they are her identity and comfort, her stylish heads are her trademark. She said the Sherpa white had she was wearing had been borrowed from another residents. The tote bags are equally important, she stores her correspondence – Sylvie believes it is rude to ignore junk mail, she writes letters back to the junk mail senders. She loves to get letters from her “friends on your blog,” she tries to answer each one. Her stamps disappear too. You can write Sylvie c/o The Mansion, 11 S. Union Avenue, Cambridge, N.Y., 12816. She said the need for new hats and canvas bags was “urgent,” she said she was terribly upset. I asked her what happened to all those hats and canvas bags, and she said she had no idea, they were just all gone. She hopped I could help her. Nobody else had any idea either. The aides were baffled, although I can testify that Sylvie loses things. 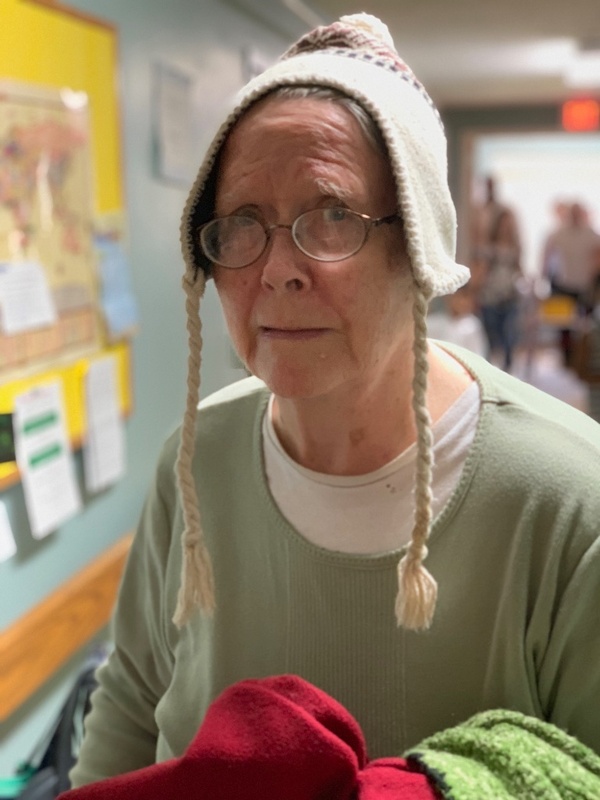 It was possible one said, that most were lost during the month that the Mansion residents were evacuated and moved to another facility because flooding. I was confused, but the look on Sylvie’s face and the desperation in her voice was clear enough. I understood right away that she dreaded going to the assembly without some of her books and research. Her look said she was in real distress, I felt for her somehow, I knew what she was feeling. I decided to get Sylvie some hats right away, she was too anxious to wait a couple of days. I activated my thrift store network and also alerted Maria, who called back right away to tell me she had some hats she could get me for Sylvia. I said I would call some thrift stores. I met Maria in town and she handed me a bag of hats. They were great I have several more coming from a local thrift shop. I’ll get them tomorrow. I ordered six tote bags on Amazon, four are coming on Thursday, two on Friday. If anyone out there wants to send her a canvas tote bag, she would appreciate it: Sylvia, 11 S. Union Street, Cambridge, N.Y., 12816. She should have them before Saturday, and I got my hands on one to give to her today. She put on the hat on the right in the above photo. I had the sense she thought the hate on the left, the one with the flower, might have been a little too loud for a religious person. I am grateful for requests like this, Sylvie had no one to turn to for something like this. I like to say I fill in the holes that the system doesn’t provide for. Small things, important things, small, inexpensive acts of great kindness. It felt wonderful to see the look on Sylvie’s face when I returned with these hats, it had only been an hour since Sylvie told me about the hats. Maybe I’ll ask some of the aides why they love the residents so much. I think for me, the answer is that it is selfish, it just makes me feel good. It’s hard to know how sheep are sometimes, especially when they have a thick coat of wool. Traditionally, when the sheep are shorn (ours were shorn a couple of weeks ago), the shearer is expected to give us his or her views about how the sheep look. They will tell us if they are too heavy or too light or if their is an infection or grow that needs medical treatment. Like most people with farm animals, we are wary of calling the Large Animal Vet. It’s $200 for just showing up, and they leave a ton of needles and medicines, because they can’t come around often to check. Liz Willis, our shearer told us that Zelda, a Cheviot, and Griselle, a Romney, were much too think. We didn’t see it because both had thick coats. Zelda, who is one of our oldest sheep, has lost most of her teeth is probably having trouble grinding the hay down with her mouth. Griselle has her teeth, but she is very old (we don’t know how old) and her ribs were sticking out, a warning sign. We aren’t sure that either on of them will be hardly enough to get through another upstate New York winter, we will decide that in November. In the meantime we give them nutrient rich sheep grain every way. We take stewardship of our animals seriously, and if there is any way to get both of them healthy without spending thousands of dollars we will do it. If not, we will not subject them to another winter with so much body fat gone. Each day, we get the two into the barn. Without Red, this was chaotic at first. 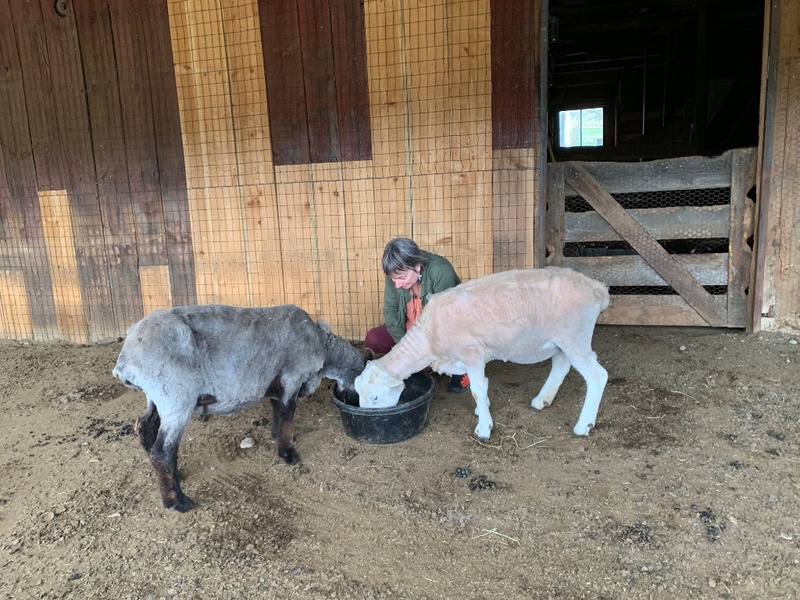 All the sheep and the donkeys tried to thunder in, but we figured it out, we were able to isolate Zelda and Griselle and now the two of them come running in while the other sheep are eating some hay or looking elsewhere. The thing about sheep is that they give up after awhile, you just have to be stubborn and keep at it. Once they get it, they are easier to handle. So this adds to our list of chores, and we take it very seriously. They’re figure out the drill. Red would have handled this easily, but he’s not in shape to do that any longer. As you know, Fate is many wonderful things, but being useful is not one of them. We see marked progress in both of them in just a week. Zelda is getting a belly and Griselle’s ribs are disappearing. This graining may be a permanent part of both of their lives. I respect cat people, and am fascinated by them. They love animals in a particular and committed way. Unlike dogs, cats don’t give it away. They challenge us to love them and trust them without the slobbering and groveling that dogs have mastered so well. Cats thrive among people by being independent, dogs thrive by being dependent. Dogs thrive by kissing our butts, cats thrive by showing us theirs. Good news for cat lovers, there is a new blog just for you. It’s called CatsinCambridge.Net and it is published by Carolyn Smith, who moved from Seattle to my town recently with the 14 cats she rescued from a rescue group that floundered. She signed up for writing help. 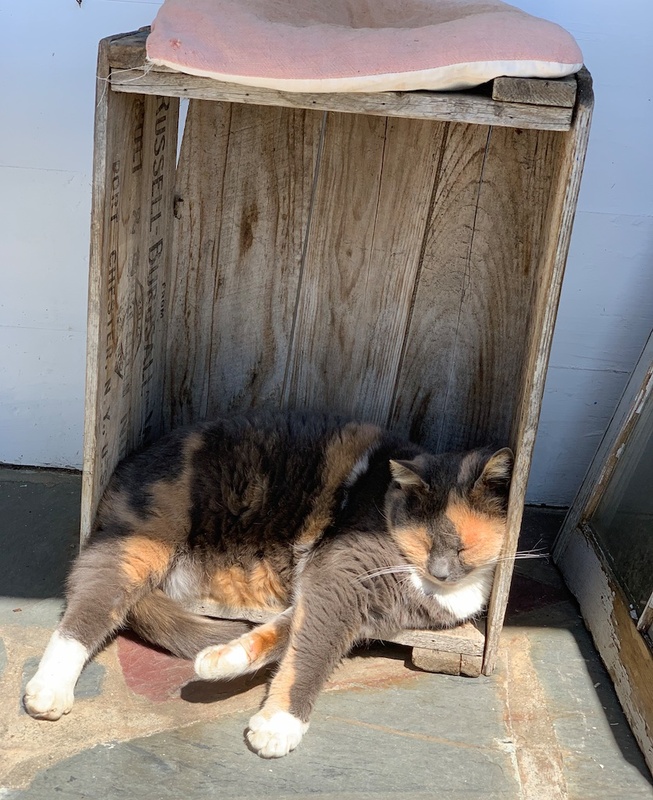 She has responded beautifully to my urging – you have heard it before – to publish a blog, to help her overcome her shyness and reticence, and to connect her with cat lovers everywhere, she will love you and you will love her. It took her months to get her blog up, she is phobic about technology. Carolyn has lived all over the worked for British Airways and cat triumphs and dramas and tragedies have followed her everywhere. She has put her flag down near my town, and surrendered to her cats. It is a great and somewhat unusual experience to find a student who listens and is on fire to write well. Carolyn listens and she writes well. She is honest and thoughtful. “It’s hard to believe that there was a time in my life when I was not owned by cats. Never-the-less, it is true. Not that I regret it for a single moment, but it all began when my friend Tim decided to buy a house,” she wrote in one of her first blog posts. If that doesn’t hook you, then you are probably not really a cat person at heart. I tell all of my students to start a blog, it is the best way to find voice, most blow me off and some don’t. Several have blogs now – Jackie Thorne, Susan Popper, Rachel Barlow, Now Carolyn – and it has become a central element in their lives, and in finding their voices, so critical for any writer. None of them regret it for a second, it has given them voice insight. Like the runner who jobs every day, the writer who writes every day will soon learn how to write. I believe people can find their voice and meaning through writing and blogs are one of the great boons to individualists who seek purpose in their lives and passions. On a blog, you can find your people. I know, I have. Cat people have their own language and sensibility. They need one another, just like the rest of us do. Cat lovers always seem a culture apart for me, I have never related to cats the way I have to dogs or donkeys, I am close to Flo and fond of Minnie, they are barn cats, not pets. I have always been fascinated by the emotional interactions between people and animals and this is the turf that Carolyn mines so thoughtfully and honestly. Cat people are passionate and intense, they are often subject to ridicule and dismissal by people and media, the phrase “cat woman” is often a put down, as if cat people are somehow crazier and more obsessive than the rest of us. Carolyn Smith is a new student in my Writing Workshop, her life revolves around cats, and she is not stereotype in any sense of the word. She’s a Brit, with all of the horror stories of a detached family and a cruel boarding school. She works for cats now, and loves it. You can find her blog here. If you love cats, or just love animals, I think you will be grateful for Carolyn. Nag her to write every day, please. I’ve looked at a lot of cat writing, much of it goes over my head. This is the real deal. 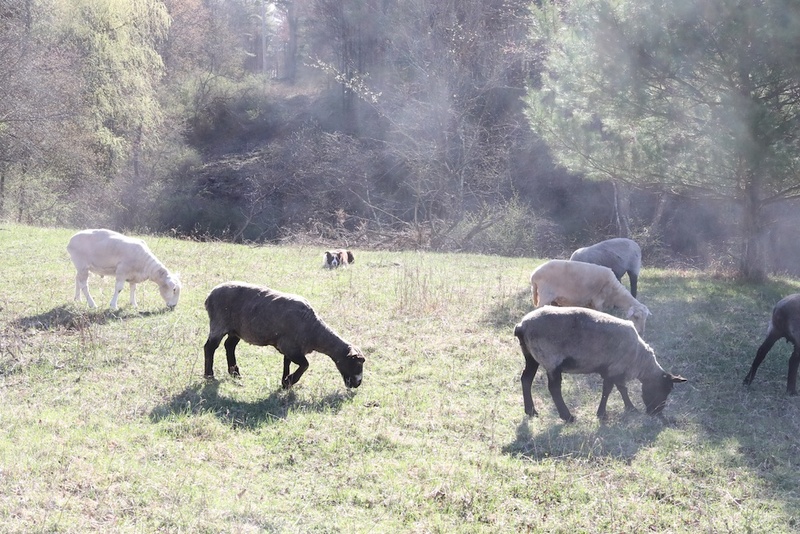 We took the sheep out to the back pasture this morning, no hay for the first time. Red and I have a new routine now, I find a spot on a nearby hill and he lies down there, he seems very happy to sit and watch. He has a new relationship with the sheep. Sheep are astonishingly skilled readers of dogs, and the sheep react very differently to Red now that he is failing. They don’t stand and watch him for signals and cues, they will graze very close to him, and his stare has lost power and focus. He is blind in one eye and losing sight in the other. They seem more like companions to them now, much like Fate is, and that Red is becoming. The tension between them is gone, Red has a different relationship with them now. They sense he is fragile, I think, and they simple accept this new kind of presence. It is sad for me to see, but also beautiful. 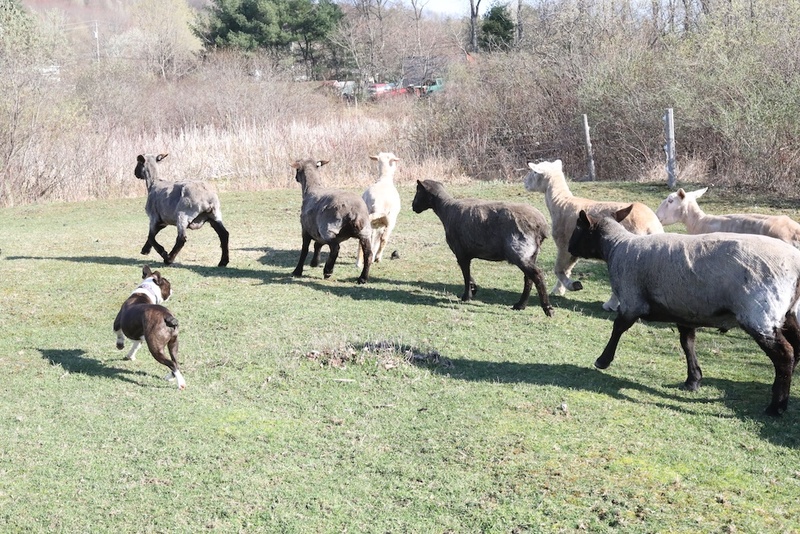 Well, there seems little doubt that Bud is doing some herding. He does a little bit of it every day. Bud is like a border collie in that he seems to want to keep the flock together. They will respond to him now, if one breaks away Bud will come around them and turn them from the front, just like a border collies. Unlike a border collie, Bud is easily distracted. He won’t herd them for long, and if he sees a rabbit or smells something good, he will abandon the sheep quickly to explore. Bud also doesn’t have the stamina of Red or Fate, if there is too much running in the sun for more than a couple of minutes, he starts to pant heavily and runs out of gas. Because of their short snouts, he can’t cool down the air he breathes, and the border collies can. I think Bud has the smarts and presence to herd the sheep, but he doesn’t have the body or lungs to do it for long. Still, he did a great job of pushing the sheep towards the rear pasture. When he sets his mind on moving them, they move.